The bollard in all its battered glory. Bollard fever is spreading throughout the UK after Preston’s infamous landmark was nominated for a top gong. The notorious Fishergate bollard, located at the junction of Fishergate and Corporation Street, is a finalist for the Smile Better Awards’ ‘City Star’ category. A Twitter account set up in tribute to the bollard – which has become a city marker known for regularly being knocked over by careless drivers – has amassed more than 2,600 followers as it regularly pays homage to the motoring mayhem that erupts around it. 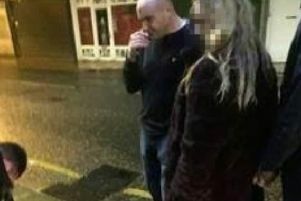 The nomination has since attracted attention from a variety of national and international outlets, something which has left the bollard “knocked out, and not for the first time”, according to personnel behind the Twitter account. Meanwhile, organisers of the awards ceremony, the Preston Business Improvement District (BID), have confirmed that a seat is to be put aside for the bollard come the big night. Preston BID manager, Mark Whittle, has confirmed that a seat will be put aside for the bollard come the big night. The bollard-less plinth, which in its own right has caught many drivers out, with cars stranded on its raised base. Mr Whittle said: “We have been in contact with the bollard and we are expecting an appearance in some capacity as well as a few other surprises. Fans will soon be able to ask the concrete creation for an autograph after Lancashire County Council confirmed it is set to return to Fishergate in the next couple of weeks. Josh Durham in 2016 playing the Ballad of the Bollard on his ukulele as the Fishergate bollard was once again knocked off of its feet.